Continental European before 1800 11 comments Who else might have painted this still life, if not Jan van Zoon? This painting was identified in 1979 by Colin Thomson of National Galleries of Scotland as by Jan van Zoon (1661–1702). In 2005, however, Fred Meijer, Curator in the Department of Old Netherlandish Painting at the Netherlands Institute for Art History, rejected the attribution to Van Zoon, suggesting that the painting was more likely Dutch around 1640, and not necessarily by a still life specialist painter such as Pieter Claesz or Jan Jansz. van de Velde III. RKD records Jan Frans van Son (1658–1701) as the son of Joris van Son (1623–1667), both born in Antwerp. Jan Frans was active in England from c.1678 until his death in 1701. Looks like Willem Claesz. Heda to me. Attached are two composites of paintings by the Flemish artist Joris (or George) van Son (1623 - 1667), who was the father of Jan Frans von Son (1658 - 1701). In the first, the beautiful scalloped glass is common to all three paintings (including this discussion's), as is the peeled lemon. In the second, the very distinctive silver salt cellar and silver beaker are also common to both. These items, of course, apart from being standard elements in many paintings of this era, could also have stayed as motifs in both father's and son's works. In any case, it it is worth noting their presence. 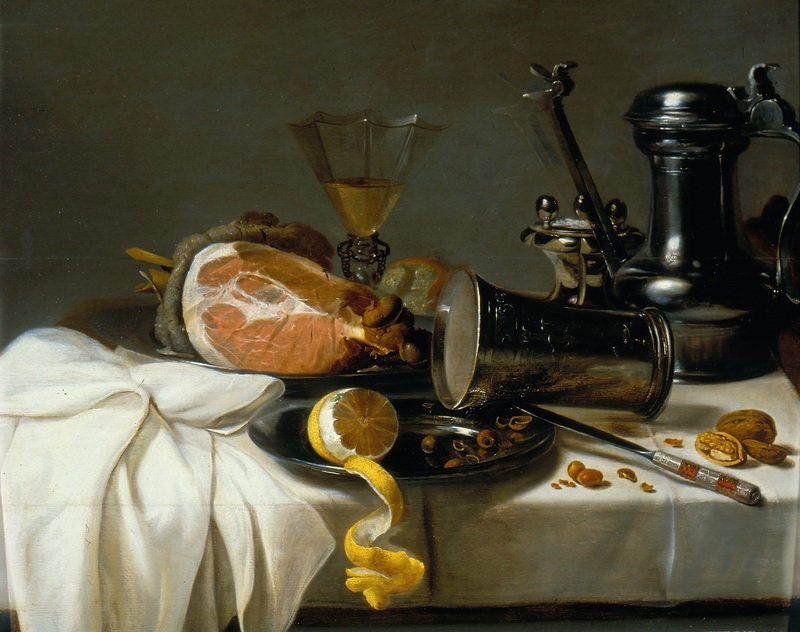 A careful inspection of other works by Joris might reveal other elements common to those as featured here, such as the elaborately decorated knife, the treatment of the ham, etc, etc. As an alternative consideration, there is an identical coffee pot featured in the attached image of Pieter Claesz 'Still Life, Food, Glasses and a Jug on a Table', from 1640. 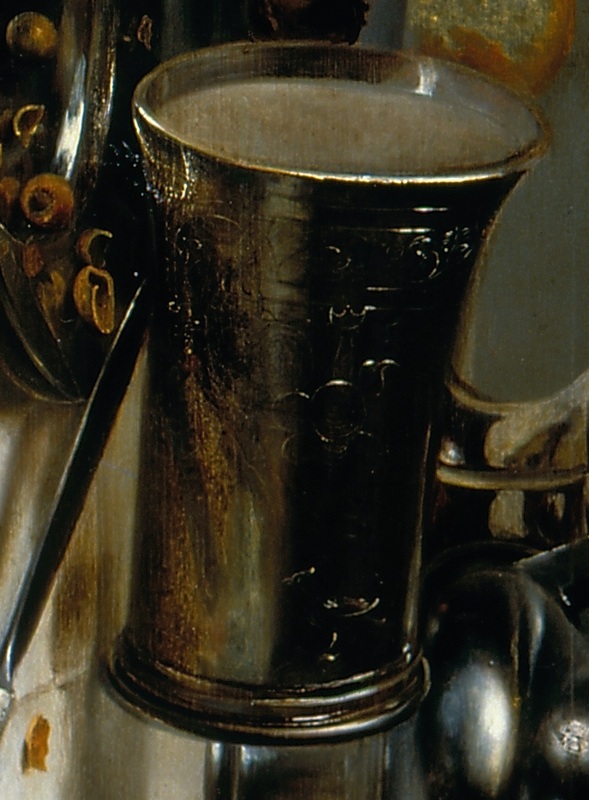 And even more intriguingly, the following link to the work of Willem Claeszoon Heda (1594 - 1680) shows many works that not only feature the distinctive coffee pot but one or two of which also show that distinctive salt cellar. None of the above, however, feature that scalloped glass that is seen in the works of Joris van Son. This could be by Adriaen Kraen who depicted the pot with the spout a number of times. Fred Meijer has left the RKD and would be very happy to look at this. He is the foremost expert on Dutch 17th Century Still life. 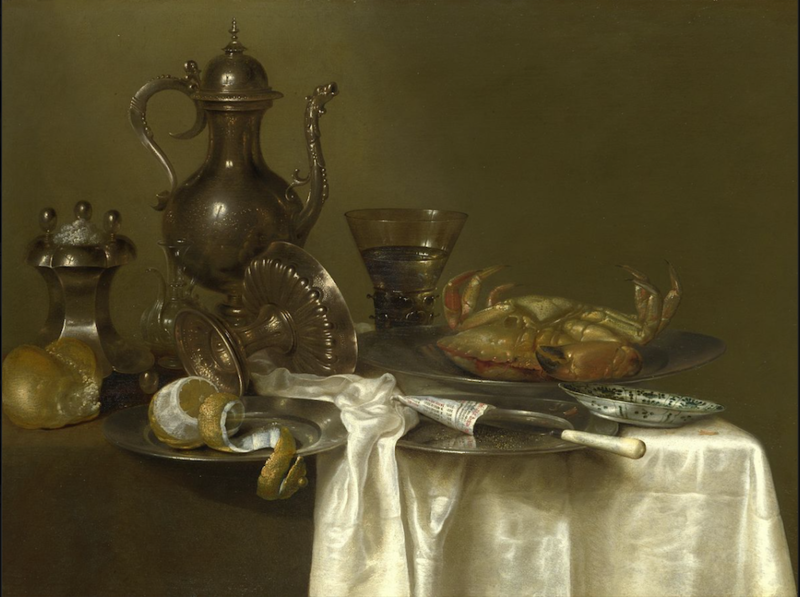 As there are some awkward passages that suggest someone less competent than Willem Claesz Heda, I think along with Kraen, Cornelis Mahu could be another possibility. He was a Heda copyist and the scalloped glass and coffee pot features in many of his works. This seems more like the work of Joris van Son than that of his son, though it may well be by another still life painter. Jan Frans van Son made his career in England, and this picture looks too Dutch for that. Painters of other vanitas works who have featured the scalloped-styled wine glass include Osias Beert the Elder (1580 - 1624/5) and his nephew Frans Ykens (1601 - 1692). The type of wine-glass depicted is usually described as 'facon-de-venise'. If W C Heda is considered, then so should his son Gerrit W Heda be. No doubt the same objects were available to Gerrit. There is some sort of heraldic beast on the beaker, but it is difficult to make out. I have attached a close-up of the beaker.